CHE-1500SW: 99-02 Chevy Silverado/00-06 Suburban/Tahoe SW Series Wire Mesh Grille Inserts (2pc). 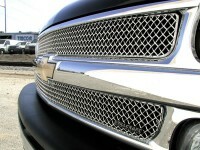 These custom wire mesh inserts will instantly add more class and style to your Chevy. Made from high quality stainless steel, they come highly polished to a bright chrome finish. Easily installs directly into the upper and lower opening of the OE factory grille. Copy of installation instructions are available below. Comes complete with installation hardware and instructions. Backed by manufacturers 1yr warranty. Made in USA. Tell your friends about the SW Series Wire Mesh Grille Inserts (2pc). Share this product on Facebook, Twitter, MySpace or send an email to a friend!